Kabalevsky’s opus 1, Three Preludes for piano, was written in his first term as a student at the Moscow Conservatory. The first prelude, in G# minor, is dated October 1925 and marked Espressivo. It is expressionistic, full of shifting colours with extended harmonies which hark back to Kabalevsky’s teenage years as a student at the Scriabin Musical Institute, where he, needless to say, would have been well acquainted with Scriabin’s work. The manuscript to the second prelude is dated November 1925, and marked Andante Mesto. It is indeed melancholy, but beautifully so. The rich chordal texture explores chromatic harmonies, growing in tension and volume, only reaching a true cadence on the tonic B minor in the final bar. The third prelude, Presto tenebroso, in E minor, is in ABA form. The first section is brooding and agitated, with right-hand repeated semi-quavers being answered with left-hand syncopation, and sweeping figuration interspersed. The middle section is much slower and absolutely gorgeous, a temporary respite which itself becomes more clamorous before the return of the opening material. This entire set is quite extraordinary, a wonderful display of Kabalevsky’s early compositional genius. Kabalevsky wrote many sets of variations and it was a form in which he excelled. The two sets of opus 40 are lively and innovative, taking original opening themes through myriad permutations. The Variations in D major, op. 40, no. 1, has a brief introduction and then the simple tick-tock theme enters, shared between the hands. This eight-bar melody is simply developed in the first three variations, but then expanded in variations four to six. The fifth variation is pianissimo, with fluid triplet figuration accompanying a crotchet enhancement of the theme. The seventh to tenth variations are rhythmic takes on the subject matter, moving into D minor. The eleventh variation returns to D major with airy and bright finger work. The final variation merges into a coda, with scale and arpeggio patterns bringing the work to a dashing completion. Variations in A minor, op. 40, no. 2,is in 2/2 time, with a more stately theme. The first variation follows in the same tempo, with the left hand taking the melody, and is followed by a lively second variation, with quavers dancing around the keyboard. The third variation is slower, toying with B flat major in an expansive melodic interpretation of the theme. This Neapolitan relationship to the tonic continues into the fourth variation, but brings us back to A minor in a playful development of the material. In the final variation, Allegro Molto, triplet figuration abounds in chord, scale and arpeggio patterns, with the flurry of notes leading to a final restatement of the Allegro Molto theme. Six Preludes and Fugues, op. 61, no. 1, opens with a short prelude, a tranquil, chordal introduction to the simple two-voiced fugue which follows. Six Preludes and Fugues, op. 61, no. 2,begins with a tuneful maestoso in C major, followed by a lively three-voiced fugue in 6/8 time. This engaging fugue rollicks from one hand to the other, with the interchanging voices chasing each other through various tonalities in a boisterous way. Op. 61, no. 3,is more solemn, opening with a resonant bass voice introducing the melody. The fugue is derived from this melody, and is developed in a peaceful manner, in three voices, before the return of the prelude material. Op. 61, no. 4 is a bright and sunny prelude and fugue in A major. The fugue flows organically from the prelude and is in two voices. Full of colour and joy, it is a work brimming with happiness. Op. 61, no. 5 is a complete contrast: its opening is dramatic and confrontational. In C minor, the prelude is turbulent, asking questions that seemingly have no answer…but then the fugue enters, hushed and still, sad but calming. In four voices, it builds to a fortissimo climax before the fugue subject enters quietly one last time to finish the piece. Op. 61, no. 6, is very rhythmic with a driving force which propels it onward. The prelude is longer this time, with sections in 2/4 time book-ending a second theme in 3/4. The fugue, in three voices, is vibrant and exciting, a thrilling roller-coaster of development which brings not only this piece, but the entire set of preludes and fugues, to a rousing conclusion. Rondo in A minor, op. 59, was composed in 1958 as a set piece for all competitors to play at the International Tchaikovsky Competition in Moscow. After an opening flourish, the rondo theme enters in the right-hand with jaunty left-hand quavers in accompaniment. The first contrasting section uses the rondo rhythm but in episodic, sequential development with quicksilver arpeggiation interspersed. This builds to a forte restatement of the four-bar introduction, followed by chromatic octaves in contrary motion which usher in the rondo’s return. In sonata rondo form, the middle segment is a stunning, dignified section which begins in C# minor, and moves through various other minor tonalities before a momentous restatement of its opening in C# minor. One trait of the Russian choral tradition is that of the znammeny chant, sung by basses, and an excellent example of this use in Kabalevsky’s music is in the low octaves which open, and permeate, the middle section, with the melody sung above. The rondo theme enters, presto, in E minor, and is developed with semiquaver sequential patterns before the return of the opening rondo in A minor. The final contrasting section features a sustained melody, doubled two octaves below in the left hand, with moving quavers in duple time in the inner voice. The vigorous coda, piu mosso, begins with the rondo theme in chords and builds dramatically to a stupendous finish. Another trait of Russian music is that of doubling at the octave, but at a distance apart. This is evident in many Kabalevsky pieces, but obviously so in the opening of Spring Games and Dances, op. 81. We are called to attention, and then the dance enters, with the melody stated in parallel chords, another characteristic of Russian music. The next section is more melodic, a gentle game perhaps rather than a dance. In ABA form, the opening melody is doubled in the left hand, with dyads in accompaniment on the off-beat. The first dance returns, but just a memory of it, before turning to a more rambunctious game. This spirited frolic is certainly more competitive, with the tune peppy and angular, leading to a triumphant second melody, and then a battle between the two, with the conclusion being strident tone clusters in unison between the hands, a battle fought to the finish! Without catching their breath, the competitors move on to the next game, some kind of running race perhaps? The urgency in the piano figuration, the lightness of touch, the digging in of heels in the unison octaves, and the rising chromatic patterns all paint a picture of entrants giving their utmost to win! Everyone seems to collapse upon reaching the finish, as the descending unison doubling leads to a grand chordal collective catching-of-breath. There is then a reminiscence of the slow game already played, and a fragment of the opening dance rounds off the afternoon of games. Recitative and Rondo, op. 84 is a momentous work, well-constructed and emotionally profound. The opening recitative is improvisatory in nature, and harks back to the chants sung in the Russian Orthodox Church. It is free and seemingly unmetered, creating an aura of profound stillness, intangible and sublime. The rondo which follows is lightning fast, with quavers in the right hand over a staccato octave base line. The second section of this sonata rondo form has sustained longer melody notes between the hands with an inner accompanying pattern. The rondo theme returns in truncated form, in a higher octave, con fuoco and fortissimo. The middle section is stark, with detached octaves as a quasi-ostinato pattern below a more legato right-hand melody. This gradually builds to a climax, then comes down to allow the entry of the rondo theme, now in E minor. The second section returns briefly, and then a short coda, which leads to the opening recitative coming in fff. The resonant octave doubling and answering chords are a heartfelt cry, reaching the depths of human emotion. 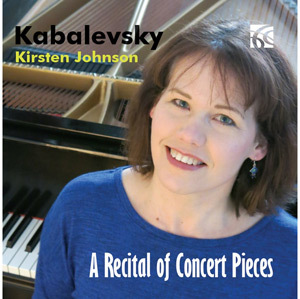 Kabalevsky brings this masterwork to a close with a quiet restatement of the opening phrase. Variations on an American Folk Song, Opus 87, no. 1, opens simply. The melody is presented between the hands, bringing to mind a Native American wooden flute. This theme is developed, gradually increasing in tempo through the variations. Kabalevsky then puts the brakes on in variation five and brings us down to the quiet tranquillity of variation six. The piece finishes with the opening melody doubled between the hands, two octaves apart. Variations on a French Folk Song, op. 87, no. 2, is indeed very French sounding. The opening theme, with its extended chordal harmonies and long pedals, shows Kabalevsky’s skill in creating different colours at the piano. The first variation is exquisite, a simple chordal figure which accompanies the decorated melodic line. The second variation is more capricious, teasing the listener with playful development of the theme. The third variation is showier, with broken-chord triplet patterns; the fourth is more introspective; and the fifth becomes starker, with harmonic development at the fore. The final two variations are lively, rhythmic developments of the theme, winding down to a quiet chorale refurbishment of the opening melody. Variations on a Japanese Folk Song, Op. 87, no. 3, opens with the melody doubled four octaves apart, a haunting placement of the theme. The first variation uses quartal harmonies and some bitonality. The next variations become faster, with staccato quavers, declamatory patterns, tenuto chord structures, and parallel semiquaver chords all variously developing the opening material. There is a fiery final variation before the piece ends with a regal and resounding reiteration of the melody. Lyric Tunes, op. 93A, composed in 1971-1972, is the last piece Kabalevsky wrote for the piano alone. The lovely, extended harmonies of the Prelude are followed by a charming, yet sometimes capricious, Waltz. The tone clusters which introduce the waltz also return at the end, lending a surreal take to this movement. Variations has a chordal introduction which then underlies the theme. The last phrase of the introduction, a riposte really, returns in commentary several times, and is indeed the material for the climax. Kabalevsky develops the melody with more complex rhythms between the hands before reaching a thundering zenith. The return of the variation melody concludes the movement, with the Coda then being a brief compilation of material from the Prelude and Waltz.